The palaeontological collections contain mainly Devonian, Tertiary, and Pleistocene (Mosbach sand, Steeden) records from the the low-mountain region Taunus and the basin of Mainz. One of the most important collections is donated by Guido and Fridolin Sandberger, which is often in use by palaeontologists. Jahn Hornung and Sven Baier (University of Mainz) could realize a very interesting time travel through the palaeontological collection of the MWNH in 2002. We hope to get an English translation next year. 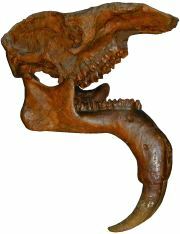 The former exhibition has presented a cast of Dinotherium giganteum Kaup, an enormous elephant of the Upper Tertiary (founded in Eppelheim near by Alzey in the region of Rhine-Hesse).